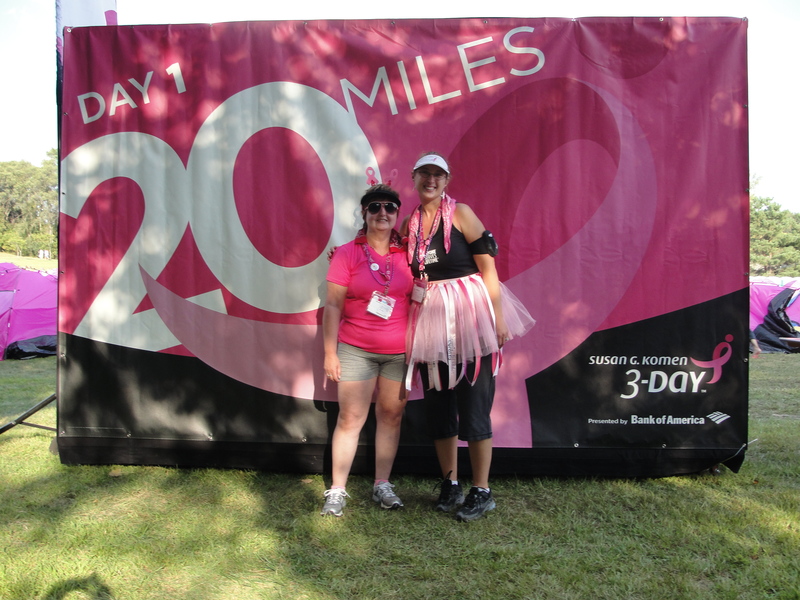 Kathi and I are ready to start our journey… 60 miles in 3 days. 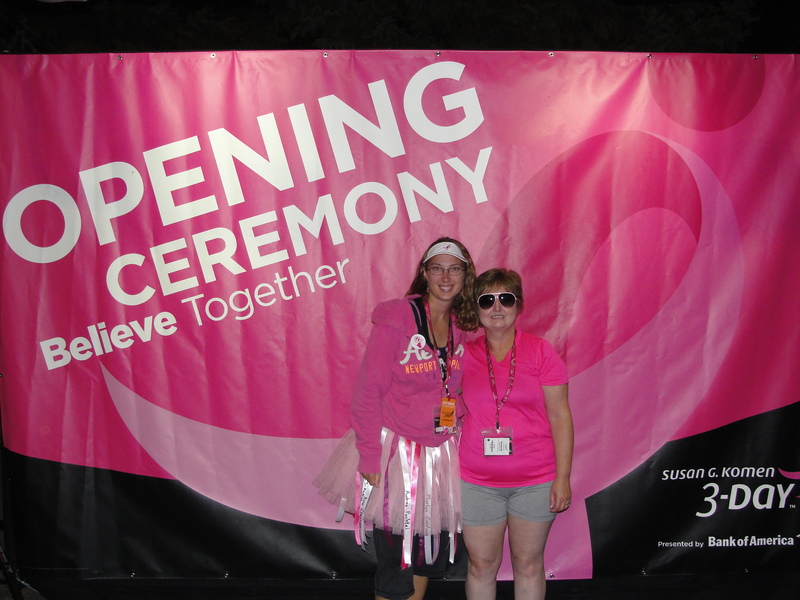 The first day of the Twin Cities 3 Day for the Cure started really early for us. My fundraising dollars weren’t all recorded on time, so even though I met and exceeded my goal, I had to be at Southdale Mall by about 5 a.m. to complete my check in. This was much harder on my husband (@StrateSQL) who is a total night owl. The 4 am wake up time was closer to his normal bed time than his normal wake up time. Still, he was a trooper. He got up and drove me and my team mate, Kathi Kellenberger (@auntkathi) to the Opening Ceremony. The Pink Grandpa. What a trooper! Once I was all checked in, we walked over to McDonald’s for a power breakfast. An Egg McMuffin and a large Cafe Mocha sounded perfect to me; just what I needed to rev up for a 20 mile walk! The Opening Ceremony flew by. Before we knew it, we were walking in a sea of pink and black, bras, tutus, and lots and lots of people. The Walker Stalkers were out from the very beginning. 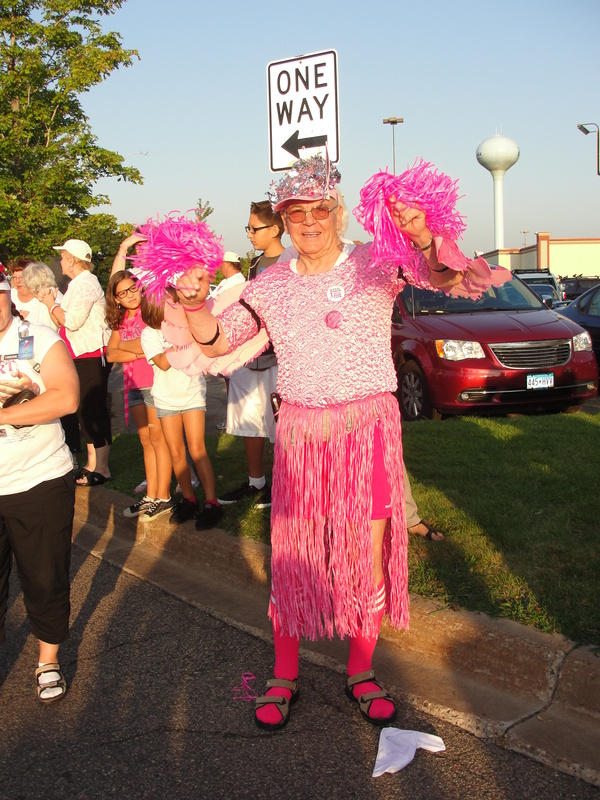 One of the first people we saw was the “Pink Grandpa.” He was out there all three days, even in the rain. Some other walker stalkers whom I met last year, and again on twitter, The Maraca Girls, were there. I gave them the pink ribbon costume that Halloween Express donated for the weekend. The miles went quick. At the end of the day, I had 5 blisters. Most of them were fairly small, and I couldn’t feel them until I got my shoes off. I did have the “3 day rash” again, but I had a fairly mild case. Kathi and I ate dinner after she helped me get my tent set up. I was lucky, my randomly assigned tent mate didn’t show up, and I got the tent to myself! Once dinner was over, Kathi decided to head to her hotel to soak her feet. I decided to skip the “camp show” and get in line for a chair massage. It felt great, but 5 minutes was not long enough! I also checked out the shops (3 Day gear, New Balance gear, etc.). On a whim, I decided to look through the camp mail. I actually got a card with some flair – a button from Mike Pink Shoes (@mikepinkshoes), a huge supporter of The 3 day. After a shower, I went to plug in my phone at the charging station. Surprisingly, my phone lasted the whole day, but I needed it charged for Day 2. My friend Ally was there. We met on twitter (@AllyBird82) and did a few training walks together. She and her team mate Mandie (@Mandelicious) were there. We got to talking with some crazy ladies from Memphis. They had a game with them that they taught us to play. It was called Bananagrams. It was like a fast paced Scrabble game. It was very fun. Finally, it was time to go to bed in my pink tent. Good night!